Every few hundred feet along Harvey’s walk sits a seemingly random chair – some next to driveways, others on front lawns. 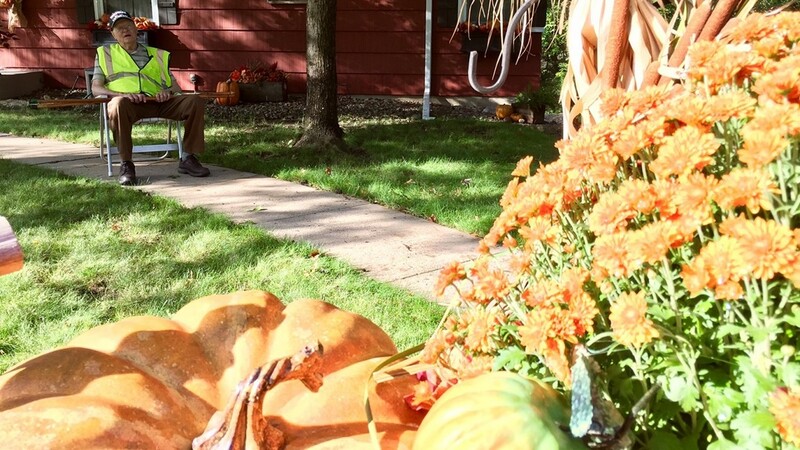 PLYMOUTH, Minn. - It is possible in the autumn of one's life, to still have spring in one’s step. Harvey Djerf, 95, is proof of that. But sprinkled along his path is proof of something else: the kindness of Harvey’s neighbors. Every few hundred feet along Harvey’s walk sits a seemingly random chair – some next to driveways, others on front lawns. All of them have been placed there for Harvey. Tom and Melanie Heuerman had seen Harvey resting in other neighbors’ chairs when they decided to add one of their own. “We put one out and he found it the very next day,” Melanie says. 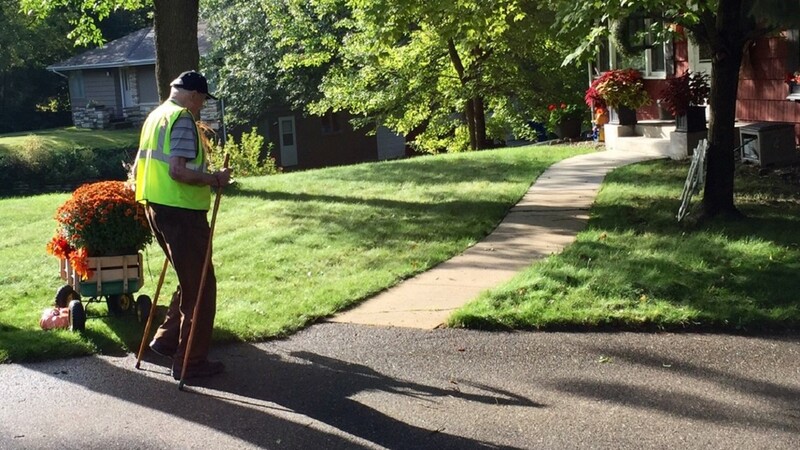 Harvey walks the same route twice a day, all year long. In winter months, Harvey’s neighbors shovel paths to the chairs. 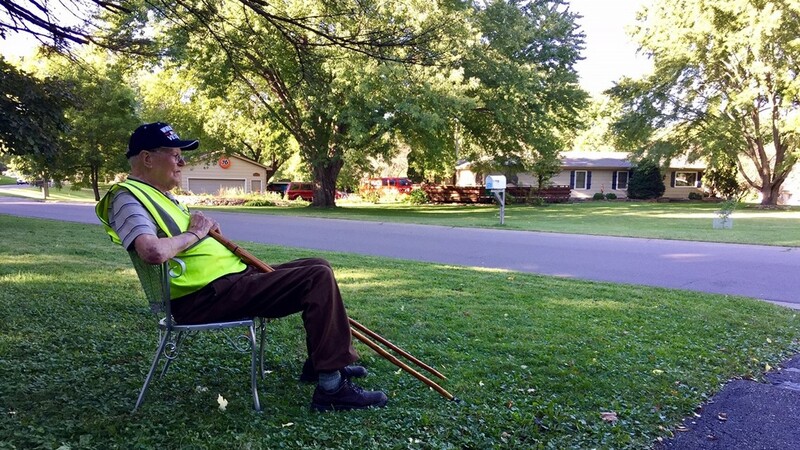 “I'll just peek out the window, ‘Harvey’s in the chair!’” says Ann Kleiner, whose husband Erik put out for Harvey a metal chair near the end of the couple’s driveway. “And it will forever be Harvey’s chair,” adds Erik. Harvey typically sits for a few minutes but is happy to linger when neighbors come out to visit. 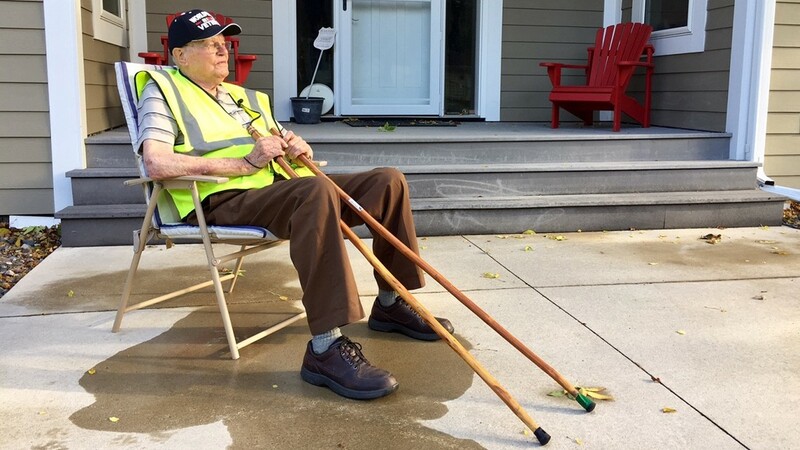 He's enjoyed the company even more since a stroke sent his wife of 69 years to nursing home. “It’s lonesome being alone,” Harvey says. Merry Anne Rosengren brings from her kitchen peanut butter cookies as Harvey nestles into her patio chair. 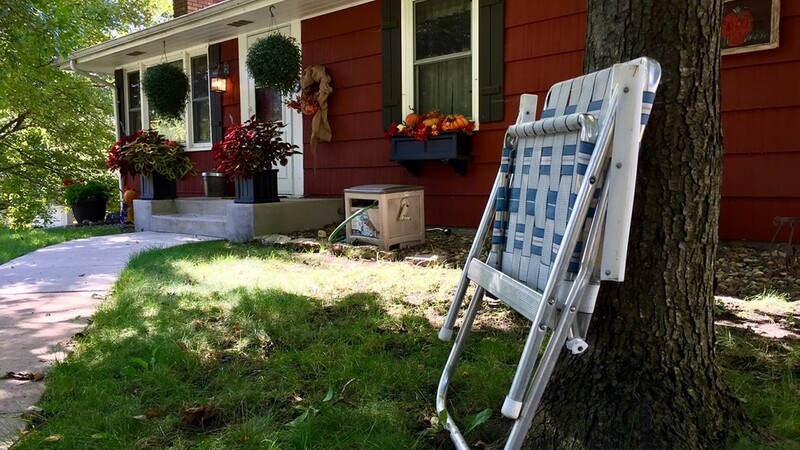 Not far away, Harvey opens a lawn chair propped against a tree on the lawn of Lynn and Gary Grey. “Here are all these neighbors who feel almost honored he wants to sit in front of their house,” says Lynn. Harvey says the honor is all his. Harvey hopes the kindness he’s been shown might be contagious. “Maybe other neighbors will be encouraged to do things thinks like my neighbors have done for me,” he says. Harvey’s chairs – like spring flowers, if they too graced us all year.